The recording of today's webinar by Judy Russell, "Using Court Records to tell the Story of our Ancestors' Lives" is now online to view for free for a limited time. As Judy explained so very well - always use court records in genealogical research! They not only provide genealogical information but give us a feel for the history of the times and what our ancestors experienced. Definitely a must-see webinar! If you could not make it to the live event or just want to watch it again, the 1 hour 32 minute recording of Using Court Records to tell the Story of our Ancestors' Lives is now available to view in our webinar archives for free through November 7, 2013. It is also available to our monthly or annual Webinar Members for the duration of your membership. 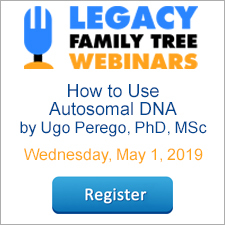 Visit www.FamilyTreeWebinars.com to watch. Judy's 7 pages of handouts are also available for annual/monthly webinar subscribers. The special discount coupon of court2 that was announced during the webinar is valid for 10% off anything at both www.LegacyFamilyTreeStore.com and www.FamilyTreeWebinars.com through Monday, November 4, 2013. Using GPS Coordinates to Tag and Record Your Photos with Heritage Collector Software by Marlo Schuldt. November 8. Legacy QuickGuidesTM have quickly become one of the more popular resources for genealogists. Each guide contains four (sometimes five, sometimes more) pages of valuable information covering a variety of genealogy research topics, dozens of clickable links, and are written by genealogists and family historians who are experts in the subject areas. The guides have been reformatted for easy use on your Kindle or in your Kindle app. If you have the PDF editions, click here to learn about copying them to your mobile device. Join us this Wednesday AND Friday for two exciting genealogy webinars presented by two of genealogy's finest - Judy Russell and DearMYRTLE. On Wednesday, Judy will present "Using Court Records to tell the Story of our Ancestors' Lives" and on Friday DearMYRTLE will present "Ancestry Trees Can Jump Start Your Research." Early court records give us evidence to prove who our ancestors were. But they’re even more wonderful in helping us understand how our ancestors lived. Learn how to use court records to add richness and depth to help tell your family’s story. Click here to register. Click here to download the 7 pages of supplemental syllabus materials (for annual/monthly webinar subscribers). Find out why Ol' Myrt gave up the notion to avoid sharing her family tree online. Secret: It's all about collaboration. This webinar guides participants through the process of creating a GEDCOM file in the Legacy Family Tree software, uploading the file to Ancestry.com, and looking for "reasonable" matches using Ancestry's shaking leaf. We then focus on deeper searches using using the "magnifying glass" and analysis of reliability of matches. Webinar Reminder: Join us for the live webinars Wednesday, October 30, 2013 and Friday, November 1, 2013 at 2pm Eastern U.S. Register today to reserve your virtual seat. Registration is free but space is limited to the first 1,000 people to join that day. Before joining, please visit www.java.com to ensure you have the latest version of Java which our webinar software requires. When you join, if you receive a message that the webinar is full, you know we've reached the 1,000 limit, so we invite you to view the recording which should be published to the webinar archives within an hour or two of the event's conclusion. Birth records represent part of a triad of records known as “vital records” which also includes marriage and death records. Vital records are among the fundamental building blocks of sound genealogical research. Birth records verify an ancestor’s identity from her beginning, usually identifying an infant with her parents. Since birth records tend to be recorded near the time of the birth, they are generally considered quite accurate. The Anatomy of a Birth Record Legacy QuickGuide™ contains valuable information on how to interpret the data in a variety of birth records including birth certificates and birth registers. This handy 4-page PDF guide can be used on your computer or mobile device for anytime access. Click here to purchase for just $2.95. The recording of today's webinar by Mary Hill, "Using Church Records to Identify Ancestors" is now online to view for free for a limited time. Mary explained about the importance of church records, the different denominations and the records they created, how to locate church records, how to find out which religion your ancestor was a part of, and how to overcome the challenges of working with these records. I loved Mary's comment, "church records are a gift from heaven." If you could not make it to the live event or just want to watch it again, the 1 hour 33 minute recording of Using Church Records to Identify Ancestors is now available to view in our webinar archives for free through October 31, 2013. It is also available to our monthly or annual Webinar Members for the duration of your membership. Visit www.FamilyTreeWebinars.com to watch. Mary's 4 pages of handouts are also available for annual/monthly webinar subscribers. 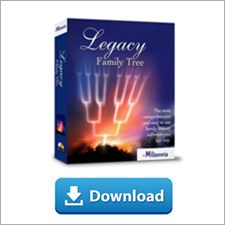 The special discount coupon of church that was announced during the webinar is valid for 10% off anything at both www.LegacyFamilyTreeStore.com and www.FamilyTreeWebinars.com through Monday, October 28, 2013. The recording of Saturday's flash/surprise webinar, taught by Geoff Rasmussen (that's me! ), is now online to view for free for a limited time. The class was taught to a live audience at the Anchorage Genealogical Society seminar and turned out great! Geoff demonstrated the class using the forthcoming Legacy 8.0 edition to teach the importance of events and timelines. If you could not make it to the live event or just want to watch it again, the 1 hour 6 minute recording of Timelines and Chronologies, Secrets of Genealogical Success is now available to view in our webinar archives for free. It is also available to our monthly or annual Webinar Members for the duration of your membership. Visit www.FamilyTreeWebinars.com to watch. The new Legacy Family Tree - Unlocked! is the perfect companion to this webinar. Both emphasize the research process and use of Legacy's custom events and timelines. Available in printed edition ($19.95 AND includes the free PDF edition) or PDF edition ($14.95). Click here for more information or to purchase. Church records contain a wealth of family history information. In this week's webinar, presented by Mary Hill, you wll learn what types of records different churches kept, how to determine your ancestor’s denomination, and where to locate these important records. Join us for the live webinar Wednesday, October 23, 2013 at 2pm Eastern U.S. Register today to reserve your virtual seat. Registration is free but space is limited to the first 1,000 people to join that day. Before joining, please visit www.java.com to ensure you have the latest version of Java which our webinar software requires. When you join, if you receive a message that the webinar is full, you know we've reached the 1,000 limit, so we invite you to view the recording which should be published to the webinar archives within an hour or two of the event's conclusion. Mary's 4 pages of supplemental syllabus materials are now available to download, save, or print. Click here and then click on the Download Syllabus button. Available for annual or monthly webinar subscribers. Click here to become a subscriber. Mary E.V. Hill, MLS, AG ® (Southern States and Eastern States); worked as reference librarian at BYU from 1989-1992, as genealogy instructor at BYU from 1992-1995, as Family History Library US/Canada Reference consultant from 1995-2006. She served on the UGA Board of Directors from 2006-2008 and as an LDS missionary at the Family History Library from 2006-2008. She is the author of Saga of a Southern Loyalist: William Riddle of Virginia and North Carolina, and Angel Children. She is a lecturer with emphasis on U.S. research methods and genealogical organization. Mary is a mother and grandmother. While waiting for his airplane en route to Anchorage, Geoff had the idea to share his in-person class with the rest of the world. Fun for the live seminar audience - they'll get to see the behind-the-scenes of hosting a live webinar. Fun for the webinar audience - they'll get to join one of the classes of the annual Anchorage Genealogical Society's seminar from the comfort of their home. Let's just hope the Internet and microphones are working...we'll see... Time zones: 5:45PM Eastern U.S., 4:45PM Central, 3:45PM Mountain, 2:45PM Pacific, 1:45PM Anchorage, 6PM GMT. Join us for the live webinar Saturday, October 19, 2013 at 2pm Eastern U.S. Register today to reserve your virtual seat. Registration is free but space is limited to the first 1,000 people to join that day. Before joining, please visit www.java.com to ensure you have the latest version of Java which our webinar software requires. When you join, if you receive a message that the webinar is full, you know we've reached the 1,000 limit, so we invite you to view the recording which should be published to the webinar archives within an hour or two of the event's conclusion. To download the update, visit www.windows.com and click on the Get the Free Update button. Thomas has become one of our favorite webinar speakers at FamilyTreeWebinars.com and has a gift for his use and instruction of genealogy and technology. Click here to purchase for just $2.99. Whether you've been researching your family history for over twenty years or you are just getting started, there comes a time when you need a trip to assist you in your research. There are many options available to genealogists: some within the genealogy community and others in the greater travel industry that can be adapted for research trips. Most genealogists and family historians these days are familiar with a variety of search engines used to locate information on the Internet. These include Google, Bing, and Yahoo as well as specialty search engines such as Mocavo. The process is pretty straight-forward: you enter your search terms and you get back a list of links to relevant websites. But what if there were a search engine that allowed queries in the form of a question and, in fact, preferred that format? You could classify the resulting search engine as more of an answer engine than anything else. And what if you could take the concept one step further and have this answer engine also calculate information based on set input parameters? Great concept, right? Well such a search engine does exist: Wolfram|Alpha (http://wolframalpha.com). What sets this computational knowledge engine apart from other search engines is the ability to pull data from external sources (meaning websites outside of Wolfram|Alpha) that are curated (meaning selected for their data reliability and sources). Click here to purchase for just $3.95.